How to play the sax line from Alexandra Stan’s (from Romania) song. First note on alto sax is G#. There are four sharps in the key. The notes for tenor sax are below the video. If your G# is sticking, this will be a bit difficult to play. Clean it with a bill if you need to. There is a little vibrato that you want to use on some of the long notes. Also, at about 1:46 in the video, there is a note played (which you can hear) but I forgot the diagram. A G# between the F# and the B, thanks to Grant for pointing that out. Thanks for this tutorial, I have this backing free available on my website. Anyone can download it there. Hey, Ken, I’m interested in the backing you have on your website. Where can I find it? What is the URL for your website? If you click on Ken’s name, it’s a link to his site. Ive just discovered your web page. Its been of great help for me. Im begining with the saxophon and your videos are perfect for my level with the instrument. Hi Neal,Just help me understand why my G sharp and C sticks,its very frustrating. That’s a common occurrence actually, at least with the G#. Doesn’t happen so often with C for me. You want to only drink water when you play and not eat anything. Then you can also ‘unstick’ the pad a bit with a money. I was wondering if you could send me notes for tenor sax if you have them? 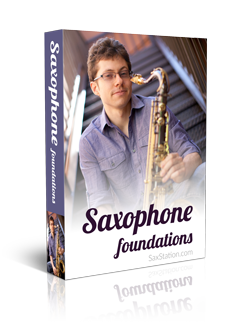 if not could you create a tutorial for tenor sax? Thanks! I just want to say that I like your site It has been a big help for me. Btw any ideas how I can get (stand by me) as I have looked for the broken down version but can’t find it any where. Thank you for your help. You could probably buy the sheet music somewhere. Or learn it by ear. This might sound a stupid question but which key is this in on Alto Sax? It’s not a bad question. Seems like it’s Am Dm7 and Em (concert). How much do you know about major scales and modes? Hi, not a lot! I’m a beginner so only know the very basic scales at the moment so wouldn’t be sure which one to use for this piece? There is not always only one scale in a song. You can buy my classes on scales and/or chords if you want to learn more from me about this. Thanks. I thought you always had to warm up for a piece with a scale? Am finding scales and what to use and when a bit confusing! Thank you, I will have a read! !